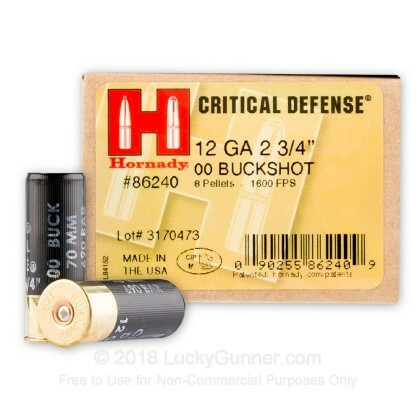 Hornayd's Critical Defense line of ammo has set the standard for high performance self-defense ammunition and it is now available in 12 Gauge 00 buckshot! 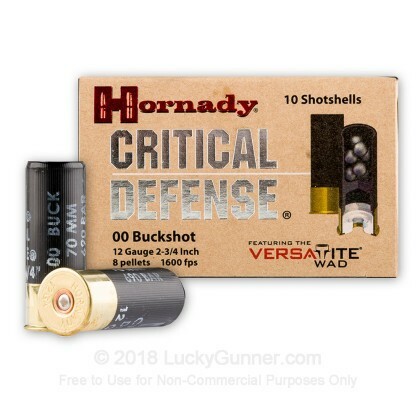 Hornady's 00 buck shot shells are an excellent choice for your premium self-defense needs. These shells function well in either pump shotguns such as your Mossberg 500 or any manner of semi-auto shotgun. These shells feature Hornady's Versatite™ wad technology which provides tight patterns that deliver devastating results. Since Hornady's start in 1949, they have set the bar for exceptional quality and performance. With a philosophy of "Ten bullets through one hole" Hornady is an innovator in ammunition technology and is trusted by avid shooters everywhere. A common rule of thumb is to expect pellet groups to expand 1" per yard beyond 15 yards; however, this ammo expanded less and produced "tighter-than-other-ammo-tested" pellet groups all the way out to 30 yards. 1. Buy a many as you can afford. 2. Shoot 1 box to say you've shot them. 3. Save the rest for zombie apocalypse. Optimum home defense shotgun ammo; this round packs devastating power and very tight groups. Cycles flawlessly in my Benelli M2 with manageable recoil. 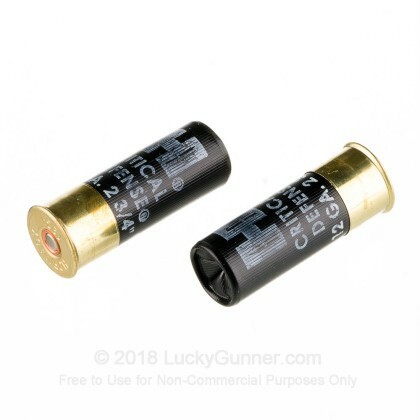 A friend and I have ordered from Lucky Gunner several times now and have not been upset one time as the products come right to the door in a VERY timely manner! Given the item it's safe for me to say that I'd surely not want to be on the 'receiving' end of ammo! I'm not going to 'waste' another round on the range though--as this is far to high quality for that. It's like my life insurance policy--something I'll never want to ever use. BUT if I have to--I am confident all will go as planned! This is some powerful ammo. No jams and accurate. I believe Hornady makes the best ammo you can buy. This was a really good deal on a quality product. Thanks again. If you are a Tactical instructor like I am and you need to pass the test use this ammo Period !!! When it came time to qualify all the others where failing because there pellets where hitting out of the circle and it only takes 1 pellet to hit out of the circle and you fail. I let them use my ammo and all of the instructor's passed. This is no lie I ended up with 5 different kinds of ammo because they want to pay me back. 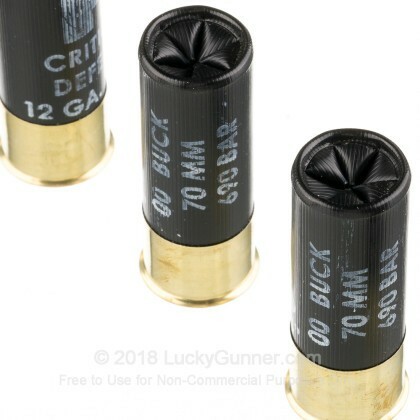 It is the tightest 00 buck ammo I have ever seen and you don't have to chock your barrel. I haven't fired these yet but I've heard that they're awesome and I trust that review from others. 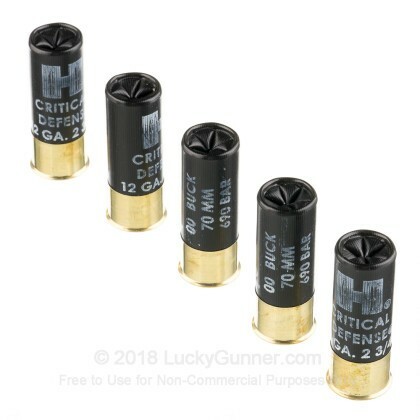 A really good ammo at a great price! 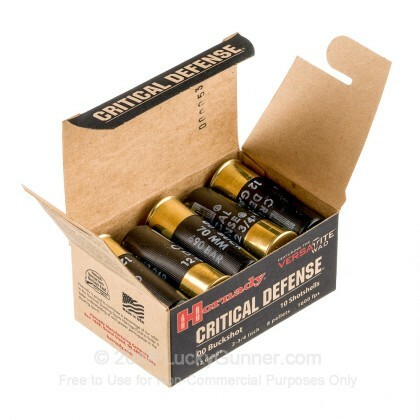 We also have this 12 ga - 2-3/4" - 00 Buck - Critical Defense - Hornady - 100 Rounds ammo in stock in a bigger quantity.